On Sunday, 12 September 2010, more than one million records were indexed by over fourteen thousand volunteers for FamilySearch. That's pretty amazing. While I was indexing this morning, I came across a sad story. It was the about the death of Charles E. Stevenson. Charles Stevenson was born 14 February 1900 in Washington, DC to William and Emily Stevenson. At some point in young adulthood he joined the United States military. By the time of his death on 22 June 1930 in Los Angeles, California, Charles was occupied as a musician. On his death certificate, Charles's death was described as Carbon Monoxide Poison, Suicide. More details were found on his body removal and burial permit. His death there was described as violent... "Carbon monoxide poisoning - Suicidal - Automobile motor operating with tube connected to muffler and placed into car." I wonder if his parents were alive at the time of his death, as the informant for his biographical information was the Welfare American Legion. Charles was laid to rest at Arlington National Cemetery in Virginia. He is located in Section W ENL, Site 21680. His military service is given as "HQ 3rd DC INF." I hope he is at peace. 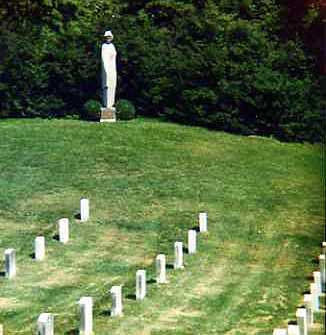 Nurses Memorial at Arlington National Cemetery about 1995.